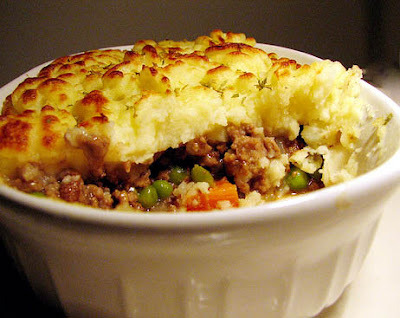 This is the ultimate English comfort food. I love the browned mashed potatoes and "meat" combination. Traditionally made with either lamb or beef, I like the non meat version better, as it's lighter and actually has more healthy plant based protein than the true meat version, but without the added fat. This can be made in individual portions or family style. Either way it's a keeper and is sure to please. 2 large Potatoes, peeled and cut into pieces. Makes 2 individual pies, or one medium size (9x9) piePrepare your potatoes and place into boiling water. Cook until tender but not mushy. Drain and add Earth Balance, cheddar and blend/mash until you have a mashed potato consistency. While the potatoes are cooking, put you olive into a sauté pan and sauté the onions, carrots and frozen peas. Once they are translucent, add the crumbles and sauté for a few minutes. Add the salt, pepper, broth, and Worcestershire sauce and sauté until thickened. Preheat your broiler. Spoon your "meat" mixture into an individual oven proof crock or a larger oven proof baking dish. Put your mashed potatoes on top, sprinkle on your smoked paprika and put under the broiler until the potatoes are nicely browned. Toss with chopped parsley and serve.